Mohammad Alterki (KUW) bt Marti Munar (ESP) 11-9, 11-8 ret. 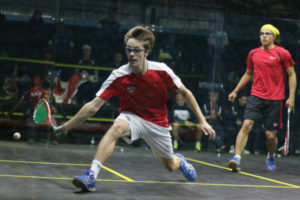 Dylan Marc Spencer singlehandedly leads home hopes into the second round of the Men’s WSF World Junior Squash Championship – but only after the withdrawal of his first round opponent in the World Squash Federation event being staged for the first time in Namibia at theWanderers Sports Club in the country’s capital Windhoek. The 17-year-old Namibian received the walkover after the withdrawal of Jordan’s Mohammad Alsarraj – and will now face Khaled Al-Jenaidel for a place in the third round after the Kuwaiti beat Tafadzwa Mushunje of Zimbabwe 11-7, 13-11, 11-8. More than 150 players from 31 countries were welcomed at an Opening Ceremony hosted by the event’s main sponsors Trustco Group International. In an address given by Quinton van Rooyen, the Trustco Group Managing Director said the hosting of the World Junior Squash Championships in Namibia was not just a milestone for the country, but also for Trustco. David Baillargeon leads a trio of Canadians through to the second round. 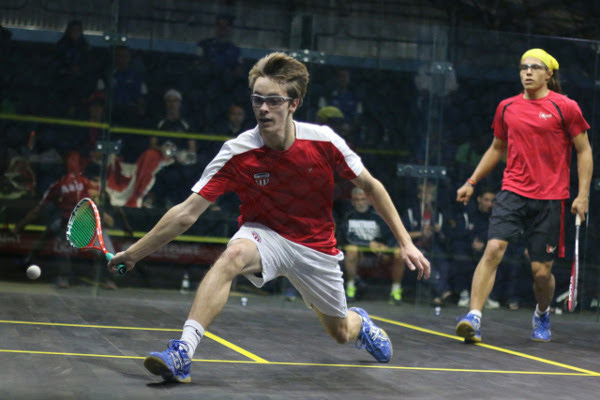 The 18-year-old battled for four games to overcome USA’s Thomas Kingshott (both pictured above) 11-5, 11-8, 4-11, 11-5.